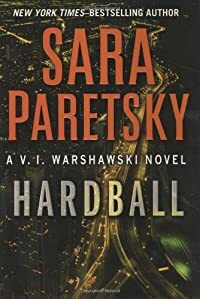 Hardball by Sara Paretsky, a Mysterious Review. Review: V. I. Warshawski is hired to find a young man who disappeared over 40 years ago in Chicago during a very turbulent time in the city's history in Hardball, the 14th (and final?) mystery in this series by Sara Paretsky. V. I. is reluctant to take on the case. For starters, there seems to be little financial incentive to do so, and if there's one thing she's learned, it's that pro bono cases don't pay the bills. But take the case she does, agreeing to spend a day or two on it. Lamont Gadsden disappeared in 1966 and was never heard from again. It's probable he's dead, but his mother wants to know for sure, one way or the other, before her sister, who's recently had a stroke, dies. Then V. I. 's investigation takes a personal turn: her cousin, Petra, visiting from Kansas City, disappears. As V. I. says, "it was hard to imagine two people with less in common" yet it seems there's a connection between Petra's current disappearance and that of Lamont 40 years earlier. The case gets even more personal when her dead father, a Chicago cop, and his brother, a former Chicago cop and Petra's father, enter the picture. What links them together? A baseball signed by a White Sox second baseman, but found in the personal effects of V. I. 's father, a die-hard Cubs fan. It's hard to imagine an author trying to combine a cold case mystery, race relations from the 1960s, the Chicago political machine, and the rivalry between White Sox and Cubs fans into a single book, but Paretsky has done this … and done it supremely well. The author takes as the foundation of her story a real event: Martin Luther King Jr. visited Marquette Park in a largely white area of southwest Chicago in 1966, at which time a riot broke out with objects being thrown at at King, including a brick that actually hit him. In Hardball, the object at the center of the story is a baseball, which misses King but hits, and kills, a young woman, Harmony Newsome. Her death, and the police investigation that followed, comes to haunt V. I. as she learns who was involved, and how it impacts her current case. It isn't clear if Hardball is the final chapter in the V. I. Warshawski series, but if so, it's a wonderful way to end. The concept of "closure" is an important plot element here, so it seems appropriate that readers also get closure with V. I. in a memorable, and possibly the best, title in this exceptional series. Acknowledgment: Penguin Group provided an ARC of Hardball for this review.